"This bruschetta is really delicious, a little different than the average bruschetta. It always gets devoured around my house, or wherever I take it. The fennel seed really makes the dish. " In a bowl, mix together the tomatoes, onion, garlic, fennel seed, basil, 1/3 cup olive oil, salt, and pepper. Chill for at least 1 hour to blend the flavors. Brush both sides of bread slices with some of the 1/4 cup of olive oil; place slices onto a baking sheet. Toast the bread until golden brown and crunchy on the outside, about 3 minutes per side. 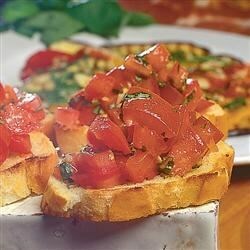 To serve, spoon the tomato mixture onto the toasted bruschetta and arrange on a serving platter. See how to make a simple fresh tomato appetizer with a little balsamic kick. 5 stars!! This was awesome and we even forgot the onion. This was a hit for Christmas Eve! I left out the fennel and used white onions. I used whole wheat bread cut up into small squares. Everybody loved it! Very good!